Well Winton proved to be a mixed bag for the McElrea Racing team. We won the round with Michael Patrizi and while he jumped from sixth to fifth in the championship at the same time Luffy dropped a place to third. Luffy – Pro Class 20th, 10th, 5th. Under pressure but running second in race 1, Luffy slightly locked the rear tyres under hard braking at turn 10. Because Luffy is a left foot braker, he doesn’t use the clutch on down shifts. In a 1/1000 probability, the gearbox gave him neutral instead of second on the downshift and when he pushed the lever again he got first gear instead of the second gear he wanted. Sitting in the mud watching the rest of the race was the outcome. 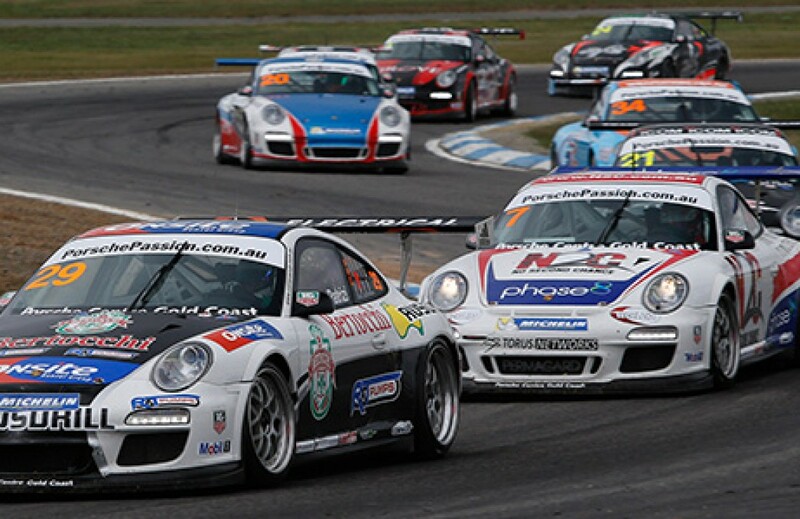 Race two and three saw him fight hard to make up for lost time netting him tenth and fifth respectively. Awesome, what can we say. Quite out of character but Patrizi was the quiet achiever this weekend. He took great advantage of mistakes by others to win his first round for 2013. We didn’t have the car speed Michael & Luffy needed but he drove brilliantly to get the job done. Awesome speed from Batesy with two second places in the elite class. It was a shame about the DNF in race two which cost us a certain second podium result in a row. After dropping to tenth in the Elite championship after the AGP, we are now in fifth and closing in on third position. Wallsy is not satisfied with his progress, being so used to winning in everything he puts his mind to. However, progress is solid and our first top five finish in Elite. In race one while reeling in the group of cars in front, Renee’s best lap time was 2.8 seconds outside the fastest lap by four-time champion Craig Baird. During the race, minor contact damaged the radiator which caused a coolant leak and resultant increase in engine temperatures. With the engine running extremely hot in the final three laps, we decided it was simply not safe to risk damaging already strained engine components further, withdrawing from the third and final race. Hats off to the team for working hard and staying sane during the emotional roller coaster that is motorsport. Next round in Bathurst is critical for us as Luffy needs to do very well to maintain points if he has any hope in winning the championship. No doubt he and Patrizi will be discussing game plans over a low fat chai latte while having their immaculate white race suits dry-cleaned. Thanks everyone for your support on Facebook and stay tuned for a video from race one from Patrizi car 29.